side at Ford's Theater and the first to prognosticate the President's demise, "His wound is mortal. It is impossible for him to recover." I arrived at Ford's Theatre about 8¼ P.M. April 14/65 and procured a seat in the dress circle about 40 feet from the President's Box. The play was then progressing and in a few minutes I saw the President, Mrs Lincoln, Major Rathbone and Miss Harris enter; while proceeding to the Box they were seen by the audience who cheered which was reciprocated by the President and Mrs Lincoln by a smile and bow. 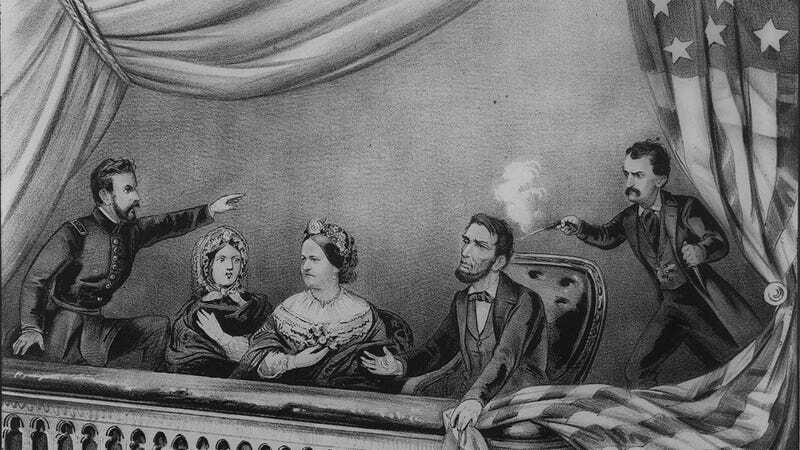 The theatre was well filled and the play of "Our American Cousin" progressed very pleasantly until about half past ten, when the report of a pistol was distinctly heard and about a minute after a man of low stature with black hair and eyes was seen leaping to the stage beneath, holding in his hand a drawn dagger. I then heard cries that the "President had been murdered," which were followed by those of "Kill the murderer" "Shoot him" etc. which came from different parts of the audience. I immediately ran to the Presidents box and as soon as the door was opened was admitted and introduced to Mrs. Lincoln when she exclaimed several times, "O Doctor, do what you can for him, do what you can!" I told her we would do all that we possibly could. When we arrived at the door of the box, the passage was found to be densly crowded by those who were rushing towards that part of the theatre. I called out twice "Guards clear the passage," which was so soon done that we proceeded without a moments delay with the President and were not in the slightest interrupted until he was placed in bed in the house of Mr. Peterson, opposite the theatre, in less than 20 minutes from the time he was assassinated. Several other Physicians and Surgeons about this time arrived among whom was Dr. R. K. Stone who had been the President's Physician since the arrival of his family in the city. At 7.20 A.M. he breathed his last and "the spirit fled to God who gave it."